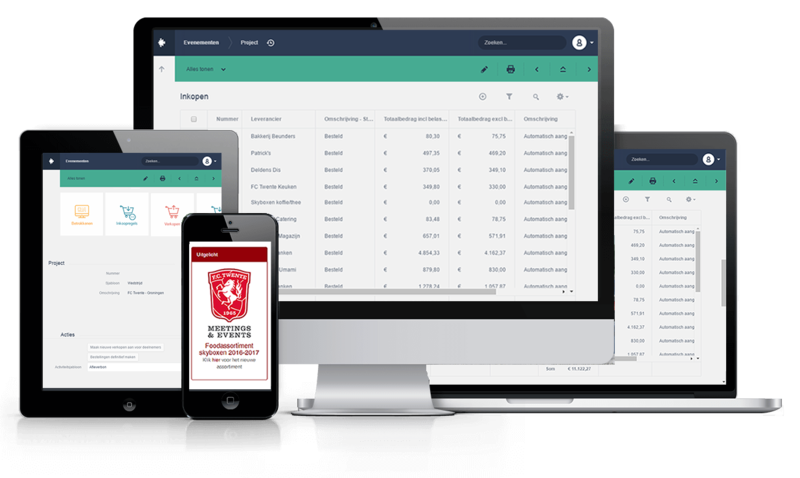 For the department Meetings & Events for of Fc Twente we delivered the online ordering system for skyboxes and event organizers. Stadion &Idquo;the Grolsch Veste” houses 52 skyboxes were skyboxholders every match enjoy size catering. From a simple snack plateau to an extensive dinner buffet. These orders were manual registed after e-mails and calls of skyboxholders, in practice a labor-intensive and error-prone activity. Fc Twente Meetings & Events began looking for ways to modernize the communication process with the skybox holders and reduce the administrative burden around orders. Because none of the existing packages this functionality was available online, Novulo came into view. With our components we delivered a costumerportal and administrative system for it online order and automatic processing of the orders and thus achieve the desired optimization. 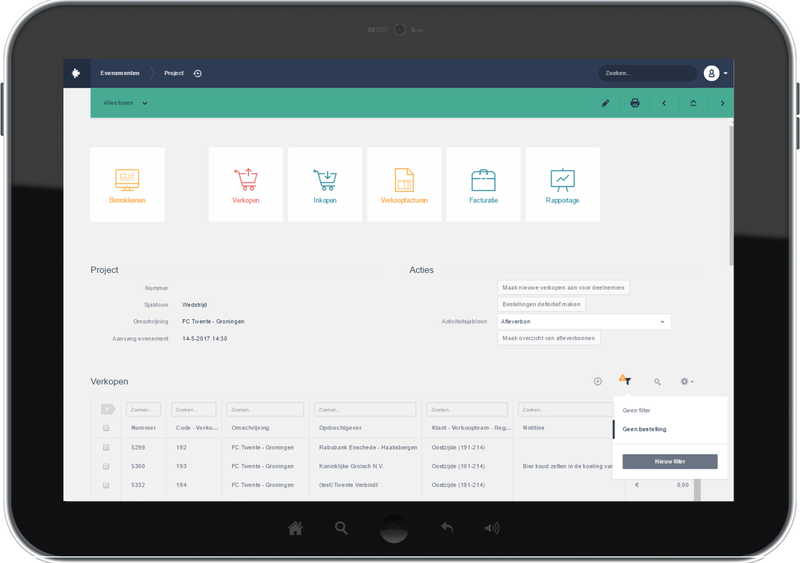 To avoid missing orders and errors in the future, Novulo for Twente Meetings & Events developed a customer portal where customers can log personally. 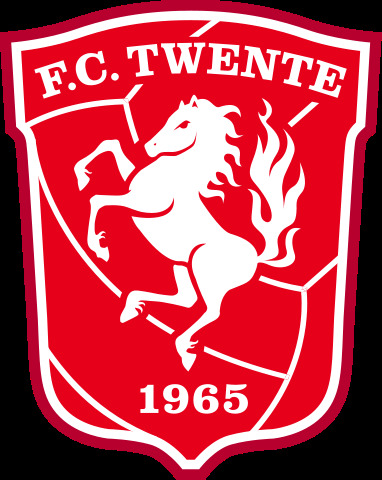 Customers FC Twente Meetings & Events can always and everywhere give their orders with their phone or tablet. This customer portal allows FC Twente Meetings & Events see its offers a selection of appetizers and entrees, the way for up- and cross-selling. All orders are processed directly in the application and automatically linked to the appropriate purchasing forms. As customers enter the order itself, prevent errors and complaints. 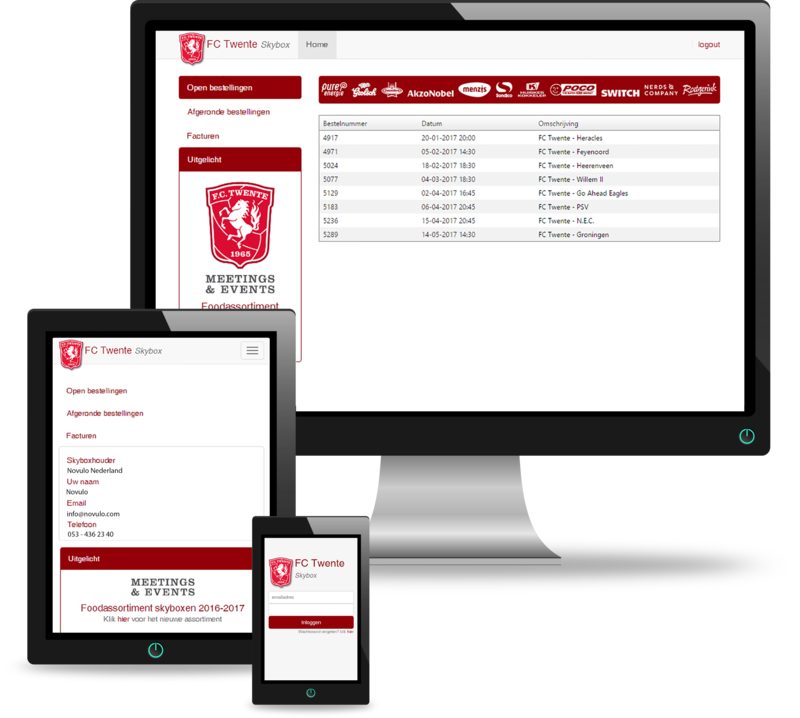 Customers FC Twente Meetings & Events related to the portal understanding of their orders and invoices. FC Twente Meetings & Events works with different prices for different types of events and works with a range of products vóór and during the event. This is possible because up éé n product can add different prices. Only the opened days and times of the event are to order products via the customer portal. FC Twente Meetings & Events caters for events at the Grolsch Veste. Per event manages FC Twente Meetings & Events various reservations with associated orders, purchasing and invoicing. After FC Twente Meetings & Events all orders received to this merged into één order by vendor. When the order arrives it is all non-food orders delivered by means of a delivery skybox. For food orders during the event automatically creates a list and timetable. Changes in these lists are always up to date. Allows FC Twente Meetings & Events see a glance what is or is not available by skybox, revenue per skybox and total revenue per event, particulars, total purchases and purchases by vendor and billing per client. Bekijk welke producten er gebruikt zijn om de applicatie samen te stellen voor dit bedrijf. En waarom dat zo goed aansluit bij deze case. Our specialist in the field of catering knows exactly what is going on in this business. She can make a good estimate what Novulo can do for your business.